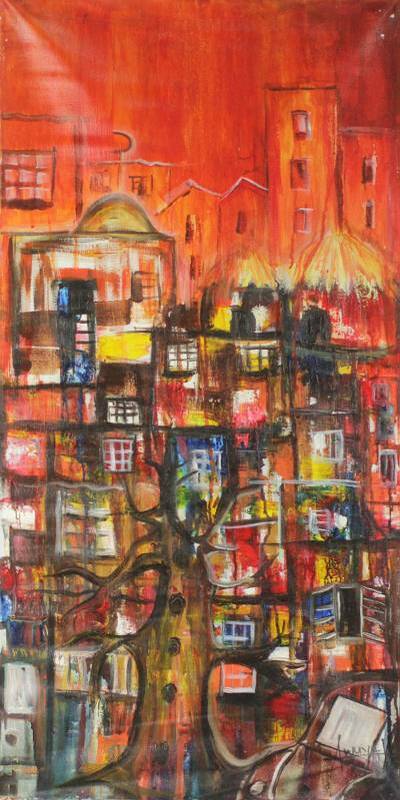 Unstretched West African Urban Themed Acrylic Painting, "Urban I"
A tree, leafless, with branches sprawling in every direction, stands in the foreground while window upon window rises up behind it. In this abstract style work, Ghanaian Kofi B. Awuyah paints the capital city of Accra, but the artist captures the universality of urban settings. Awuyah uses acrylic paint on canvas; his bold use of bright colors and concern for expressing emotion lend an air of Fauvism to his art.